I’m so excited to be talking to fellow HQDigitalUK author M. J. Hollows to the blog today. His novel Goodbye for Now is on my tbr pile and I can’t wait to get started! Hi Mike, welcome to the blog! Tell me a bit about you and your latest work. Hello! I’m Michael Hollows, or M.J. Hollows, a writer and academic living in Liverpool. I’m originally from London, but I’ve lived here for eight years now, and I don’t intend on leaving any time soon. 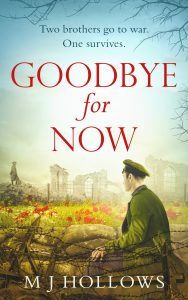 My latest work is my debut novel Goodbye for Now, an historical fiction set in The Great War, and published by HQDigital/HarperCollins. Goodbye for Now is a novel about the Great War. Younger brother George signs up to fight as a boy soldier and his older brother Joe becomes a conscientious objector. The novel shows us their own experiences of hell. Read as much as you can: Like any piece of art, or any job, you need to learn your craft. By reading other writers, both good and bad, in as many genres as possible, you can really start to appreciate how people write, how to achieve certain effects, and also what clichés to avoid. Write: I’ve lost count of how many people, upon hearing what I do, have said something along the lines of ‘Oh I’ve always wanted to write a novel,’ or ‘I’ve been writing a novel for 12 years.’ I appreciate that ‘real life’ can get in the way, but if it’s something you want to do professionally, then it can’t hurt to treat it like a profession. I have a daily word-count that I always hit, which can change over time/project, but it gives me an incentive to write and something to aim for. Allow yourself to write badly: I don’t believe in writer’s block. I believe in fear of failure. Very few writers can write a decent first draft. Many professionals go through several periods of editing and revisions to get the book to what you as a reader see. Give yourself the freedom to tell the story, to get it done, then you can go back and turn it into the best novel ever written. Once you can see what needs to be fixed, it is a lot easier, but if you have no words on the page to start with, it’s impossible. Whenever anyone asks me this, I always say that I’m a ‘plantser’. Honestly, it depends on the project. I tend to write a plan of the overall arcs of the story, and what points of conflict happen in each scene, or what you might call ‘beats’ of the story, but there’s still I lot I discover as I’m drafting the novel. I don’t usually write linearly, that is to say from page 1 to page 350, but jump back and forth as I’m exploring characters and themes. This allows me to seed stuff through the novel, and develop themes and character traits that I didn’t originally envisage. To be happy. What that means? I can’t really tell you. Often through masses of research. The names in Goodbye for Now all come from a 1901 census of Liverpool, painstakingly going through and working out the most common names, then seeing which fitted which character. I put a lot of emphasis on names, and I think they’re really important to showing who a character is. Sometimes, though, they just come to me when I think up the character and they stick. I have done, but I was put off by all the awful photos. Never again. See earlier about Writer’s block. 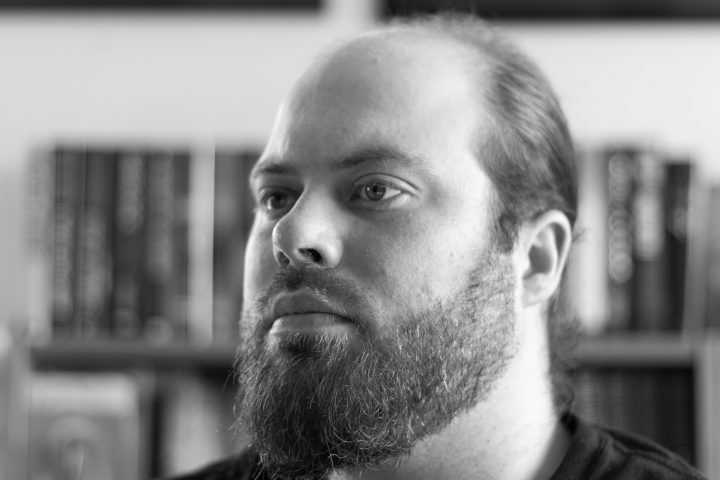 I don’t write linearly, so if there’s something I’m struggling a bit with, I either stop and jot out what is supposed to be happening in that scene, or I move on to a scene that I’m more comfortable writing. At some point I have to go back, but by then I’ve usually found that it’s had time to gestate and I know what I need to write. Goodbye for Now took a long time, partly because it was for my MA in writing, and partly because of the amount of research needed. The more confident I get with writing the quicker it becomes. The novel I’m currently working on has mostly been written over the last 6/7 months, but there was some research time and plotting before that. I would probably say plotting. I’ve struggled before to give a clear synopsis of the novel or story which includes every aspect of the plot. This is usually because a lot of details come to me while writing, but maybe if I plotted more I would get better at this. I also feel that no writer ever stops learning, there’s always things we can improve on, and I never give up looking for ways that I can improve even the things that I think I’m already pretty good at. This is such a complex question, and again it really depends on what I’m working on. The difficult thing is probably the almost-crippling self-doubt. There’s a point in a novel that you strive for, where you no longer feel like you’re starting a new project, but that it’s in full swing. Usually about 30,000 words, but it can vary, and the doubt comes back periodically to remind you that you have no idea what you’re doing. The easiest part is probably editing. By that point, I’ve done the long slog of getting the story as I imagined it onto the page. Now I can go to town making it work and fixing it, but there’s a lot less pressure then. Studying my MA in Writing was a huge learning curve, and I honestly think it would have taken me many, many more years to get published if I hadn’t enrolled on it. Working with the lecturers and peers on the craft, workshopping each other’s work, it was all indispensable. I thoroughly recommend a formal learning environment to anyone wishing to take writing seriously. I write almost all my prose on a computer, but I have lots and lots of hand written notes, from reminders of things to add/fix, to characters, to names, bits of plot, all sorts. I always have a notepad next to my computer and I jot stuff as I think. Sometimes I will print out the prose and then scribble all over it, before going back to the computer to make the changes. This is such a difficult question! Sir Terry Pratchett has to be mentioned as the funniest writer Britain has produced. Everyone should read Discworld. It’s clever, it’s snarky, and it’s not fantasy as everyone expects. Another huge favourite is Bernard Cornwell, he helped me to love historical fiction, and the Uhtred books are a brilliant example of Early-Medieval Britain. I read so much, I really couldn’t just pick one. This is worse than desert island discs! I will say that The Hobbit is the book I have probably read the most. It was the first book that I ever loved, and helped me to love reading. As I’ve grown older, I’ve started to notice its problems more, and I don’t really read it any more. I am a firm believer in the power of the bath! Yes, that’s right, a man who likes baths. It’s also prime reading time. (Before you ask, I’ve only ever dropped one book in the bath, thankfully it wasn’t very good!). I also build and paint wargames miniatures, which is one of the most cathartic hobbies I’ve ever encountered. I play guitar too, badly. It depends on the time of day! Tea for breakfast, Earl Grey in the few hours after lunch. Coffee at all other times. Both. Either. Depends. I like a good beer, usually an ale like an IPA, but I’m also partial to a glass or two of a nice Cabernet, or Tempranillo. Possibly the most middle-class sentence I’ve ever written. Yes, please! I’ve never understood why curly fries are any more popular than chips? They’re pretty much the same thing, in a different shape! Put cheese on them and we’re talking. Definitely kittens. I love cats, we used to have five when I lived with my parents. I’m not really a dog person, though I did once have a Labrador who was lovely. I’m not scared of them, just really indifferent. Autumn. Maybe I like to be contrary? I was born in Autumn, and I really love the twilight evenings, the way the light changes as it gets closer to Christmas and the street lights start to look like jewels rather than the harsh orange glare you get in summer. I’m also awful in hot weather, my brain just switches off and gives up. I like the slight chill you get in the air in autumn, not too cold, but enough to keep you awake. By the end of The Great War only one brother will survive, but which? Thanks for joining me, Mike! Grab Goodbye For Now here: amzn.to/2x6fhWv It’s also the perfect gift for anyone who loves historical fiction and word make a great Christmas present!